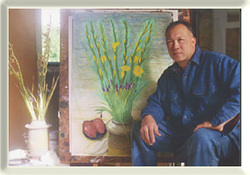 The son of Cantonese-Jamaican parents, Wong Shue, whose work has been displayed internationally, was born in Jamaica, West Indies in 1952. At the age of fourteen his father sent him to Canton, China to study drawing under master artist Alfred Chin. He also studied art in Jamaica and currently resides in California. For Wong Shue, the life of the artist is a two-fold issue. He believes that “The artist creates the art, and the art creates the artist.” This philosophy has allowed Wong Shue to approach the creation of his artwork with complete freedom from conventional restraints, which often restrict the artist. The result is a style of painting combining several mediums at once to achieve a look that is both timeless and very contemporary.